On Monday, April 8, the Florida Panthers announced they had hired Joel Quenneville as their next head coach. The announcement comes on the heels of the news that they had fired Bob Boughner. Quenneville will be the Panthers’ 16th head coach in franchise history. The Panthers fired Boughner after two seasons and a cumulative record of 79-62-22 and a .552 points percentage. Despite point totals of 94 and 86 in his two seasons, Boughner failed to lead the Panthers to a playoff berth in either season. Prior to being a head coach, he was an associate coach with the San Jose Sharks for two seasons and a head coach with the OHL’s Windsor Spitfires, the team he still owns. Replacing Boughner is Quenneville, the three-time Stanley Cup winning and future Hockey Hall of Fame coach, who was fired by the Chicago Blackhawks on Nov. 6, 2018 after 15 games and a 6-6-3 record. When the 2019-20 season begins, it will be Quenneville’s 23rd season as an NHL head coach and the Panthers will be the fourth team he’s coached, having been behind the bench for the St. Louis Blues, Colorado Avalanche and Blackhawks. He has had a winning record everywhere he’s coached, most notably the Blackhawks with whom he won Stanley Cups in 2010, 2013 and 2015. For his career, he has a record of 890-532-77-137, and his teams reached the playoffs in 18 of 22 seasons. His 890 wins are second-most behind Scotty Bowman’s 1,244. Quenneville agreeing to coach the Panthers was somewhat of a surprise after he was connected to the Philadelphia Flyers and Edmonton Oilers coaching vacancies after the Blackhawks fired him. 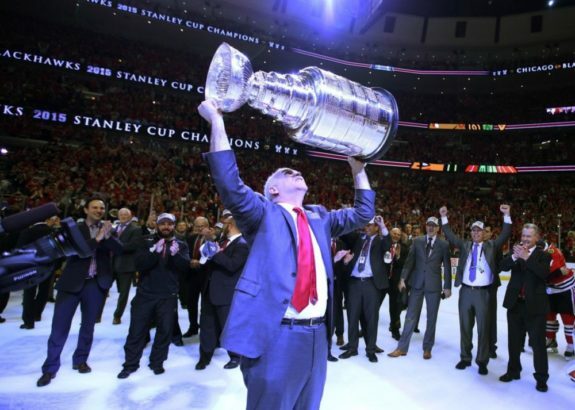 However, his decision reconnects him with Panthers general manager Dale Tallon, who hired Quenneville when Tallon was the Blackhawks general manager, a position he held from 2005-06 through 2008-09. He’s been with the Panthers since the 2010-11 season. By hiring Quenneville, the Panthers are signifying that they want to be a Stanley Cup contender. They have a great core of players headlined by Aleksander Barkov, Jonathan Huberdeau and Aaron Ekblad. Now they’ve added one of the greatest head coaches in league history to lead their talented core.